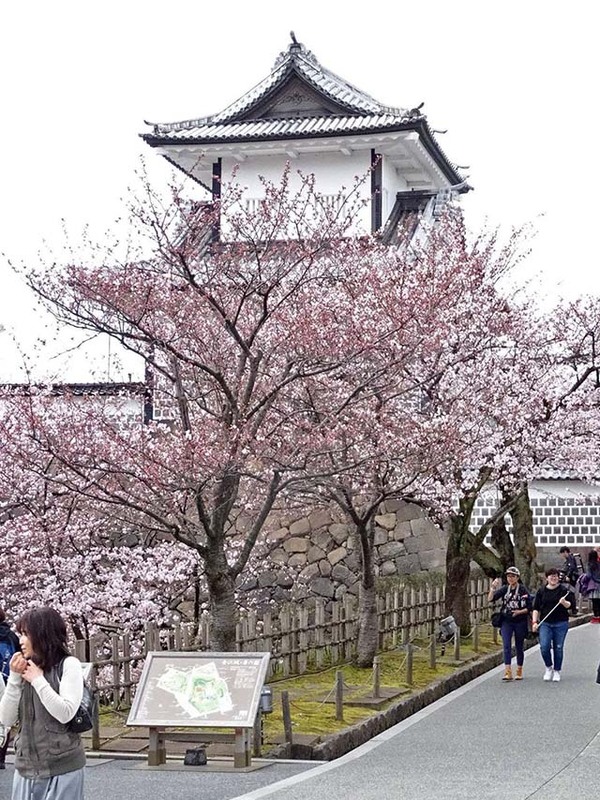 Take a tour named Japan in Spring and it’s perfectly reasonable to expect to see cherry blossom ... and lots of it. What I didn’t expect was the fervour that came with the pursuit – I can now identify with those crazy tornado chasers in the southern USA! 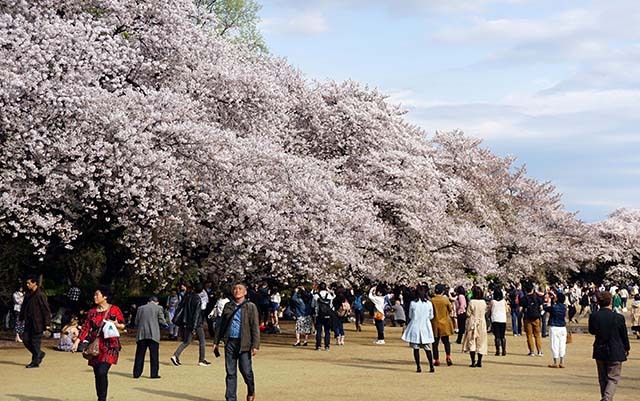 We certainly didn’t put our lives at risk but many of us were surprised at the lengths to which we considered going so as to not leave Japan without experiencing cherry blossom. 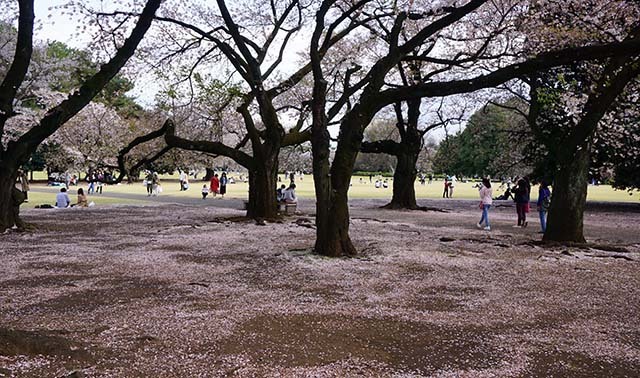 Arriving in Tokyo we learnt we weren’t too late – the sakura buds were still curled up on the trees, barely starting to wake. 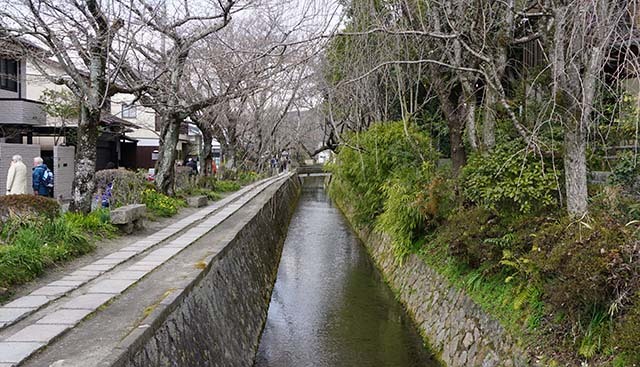 In former capital Kamekura, warmer weather had brought full bloom on some trees and we were content we were on course. Chasing cherry blossom sneaks up on you. To start with, it’s not that important – something to tick it off the list ... bragging rights ... no doubt pretty but not exactly life changing – but the chase takes on far more importance as the local frenzy builds. Cherry-blossom-flavoured everything is for sale and we lent our full support – ice cream, tea, chocolate, lollies. A pop-up TV channel reports 24/7 on the current status of the bloom AND its predicted progress across the nation. It’s all tied to the weather – sunshine and warmth are good; cold slows progress; wind and rain are bad as they can ruin the bloom in an instant. A few days before we arrive in Kyoto, hoping to see the trees lining Philosopher’s Walk groaning under their load of blooms, official predictions were looking positive and we were looking smug. But how ephemeral the ephemeral can be. Just like those pesky tornadoes in the US, we got ahead of the game and the bloom was now chasing us ... we were too early! 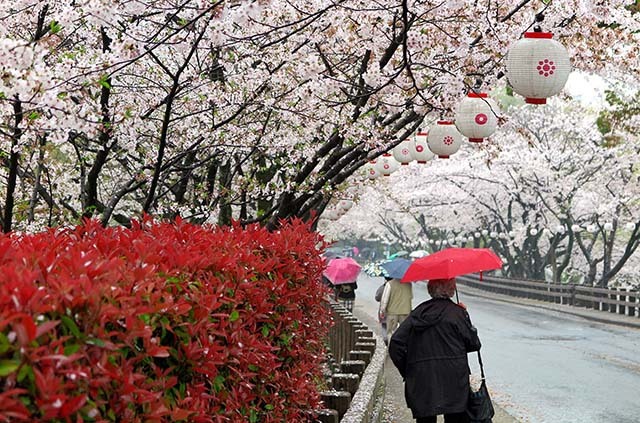 We were walking a weather knife edge: with no blossom yet in Kyoto, news broke that Tokyo’s already-full bloom wouldn’t last long enough for us to see it ... we would be too late! We looked into cutting short our stay in Tokyo at tour-end to return to Kyoto. We investigated changing flights, buying bullet train tickets and booking hotel rooms. The thought processes of sensible adults went … well … silly. We started to come to terms with the disappointment that was probably to be our lot. We could come back … what we’d seen already was still very pretty … who likes cherry blossom anyway? And then we returned to Tokyo. 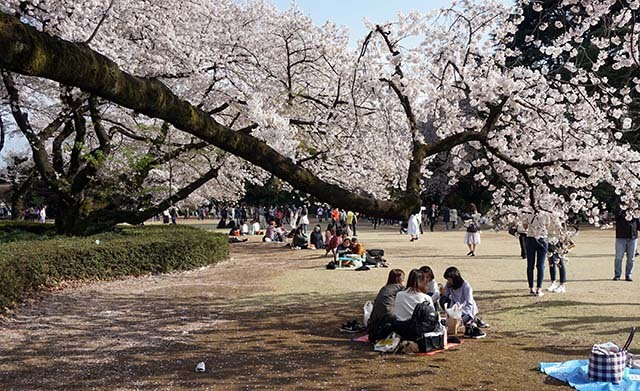 Into the city’s beautiful Shinjuku Gyoen park we went and the chase was over: ahead lay some 400 somei yoshino trees, boughs heavy with sakura. You instinctively look upwards – not a single green leaf on the 8-10m tall trees … just endless puffs of tiny, delicate pale pink and white petals, straight out of a fairy tale. But don’t forget to look down – beneath the trees lies a soft dusting of the petals that have already let go. Wander underneath the floral arbour to enter a different space; wander on the surrounding manicured grass and look in from the outside. Every perspective is breathtaking – and well worth the chase. It’s a very special experience to be immersed in such natural beauty while cradled in the arms of the world’s most populous metropolis. Such is the wonder and striking contrast of travel to Japan. Blue Dot Travel offers Japan tours for small groups and families. Our next trip to Japan will be in 2019 and coincide with the Rugby World Cup. Click here to see the brochure for the family tour which can depart at a time to suit you. Blue Dot Travel offers Japan tours for small groups and families. Our next small group tour to Japan will be in 2019 and coincide with the Rugby World Cup. Click here to see the brochure for the family tour which can depart at a time to suit you. 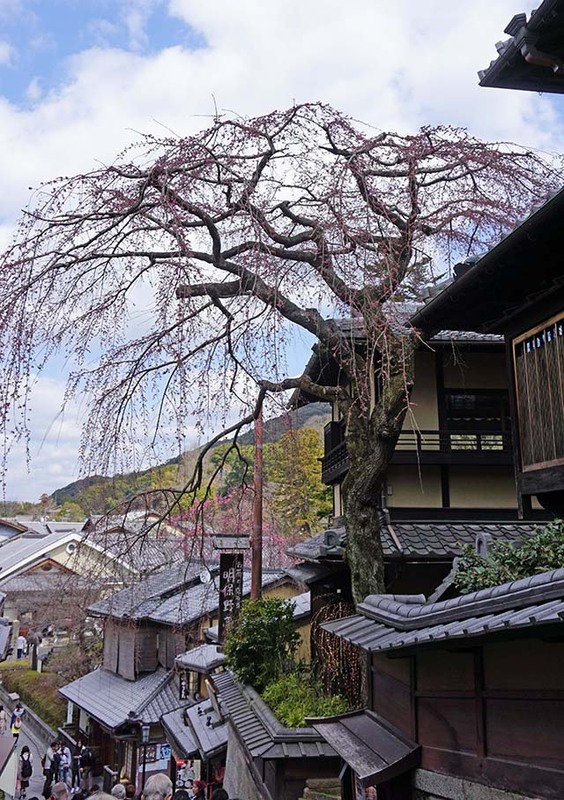 We could only imagine how beautiful this tree in Kyoto would look in full bloom - too early by a couple of days!